I have to admit that the past few weeks, I have been posting quite a few Asian dishes, each with its unique way to prepare and to cook Asian food. 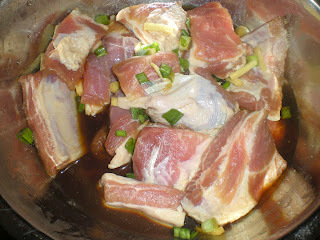 Here is another Chinese cooking preparation, marinade meat with soy sauce and rice wine. 1. In large bowl, combine all ingredients except for the ketchup. Cover and marinade for 6 hours. 2. In a skillet, heat oil over medium-high heat. 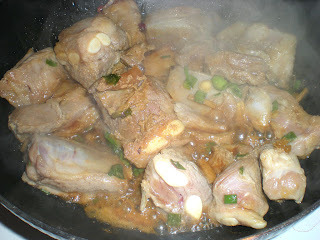 Pan fried spareribs until all browned. 3. Add in the marinade sauce and ketchup. Cook until all the sauce is absorbed about 20 mins. Serve. Nice! I love spare ribs, but I have a hard time straying from the North American way of preparing them: braised, then doused with barbecue sauce, and finally charred. This is very different, but definitely something I should try - the marinade must make them nice and tender! Victor this looks absolutely scrumptious! i love any slow-cooked meat! 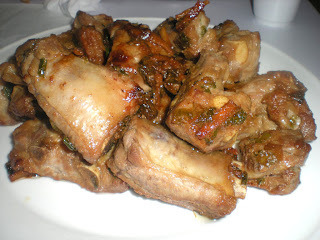 i could totally smell the fragrance when this spare ribs were being cooked! I have never made sweet & sour sauce with ketchup so I will have to try this. As I think about the flavor it must add a nice spiciness. Sweet and sour pork is a favorite, also with chicken. Yours looks very good indeed.